Got this idea from P is for Pink's Blog but I changed it to fit my holder. 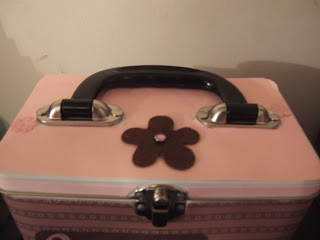 The outside of the tin is decorated with SU Berry Bliss paper (love the pink & brown combo). The square is cut from SU Chocolate Chip cardstock and the letters are rubons that I had. The flowers and brads are from my stash. The ribbon is also SU. Inside: I used SU tab punch for the tabs. 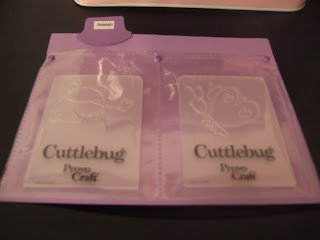 I cut various pieces of cardstock (non su) and then took baseball card sleeves cut them so that they still had their seem and attached it to the cardstock with brads (2 dies or small embossing folders go on the front and 2 on the back). 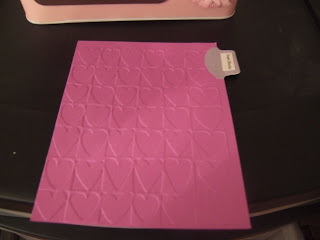 For the large embossing folders I embossed the front of the cardstock and then the folder will go behind the cardstock. I am happy with the way this turned out and I'm glad my embossing folders and small dies will finally be organized. Any questions please leave a comment or email me. Thanks for looking. What a FABULOUS idea!!! I think I just might need to do this! Thank you for sharing! Super Super cute Chrissy. Such an awesome idea! Thanks for sharing the link to the other blog too. Ok, this is just creepy. 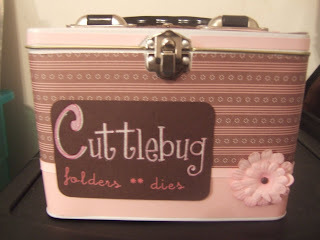 I've been looking for something to store my Cuttlebug folders in as well. I just saw a plain tin yesterday and started thinking I could jazz it up for storage. I guess great minds think alike! I love how yours turned out! thanks for sharin. That is great!